I FINALLY finished building my dream Z pallet, so that post will be coming soon, I'll be taking pictures and swatches of that today!! But today, I went full out, with a purpley/plummy smokey eye and falsies!! BACE: I started with a light moisturizer, then SPF 60 sunblock. I let those two sink in, then I took ELF green primer and patted that onto my cheeks and forehead to minimize redness/splotchyness. I then squeezed out a SMALL amount of Makeup Forever Mattifying primer, and I patted that into my forehead, nose, between the brows, my upper lip, smile lines, and chin. Remember, I only squeezed out a pea sized amount, so I used a Small amount all over!! I let the primers sink in, Then I squeezed out a quarter sized amount of Garnier oily skin BB cream onto the back of my hand, then I dotted and spread that out all over my face. Then took a Real Techniques Expert face brush and REALLY buffed the BB cream into my skin. I then was feeling super extra, and took Rimmel clear skin translucent powder and buffed that into my skin, THEN I took a fluffy brush and patted Sephora Matte perfection Powder foundation all over my skin!! 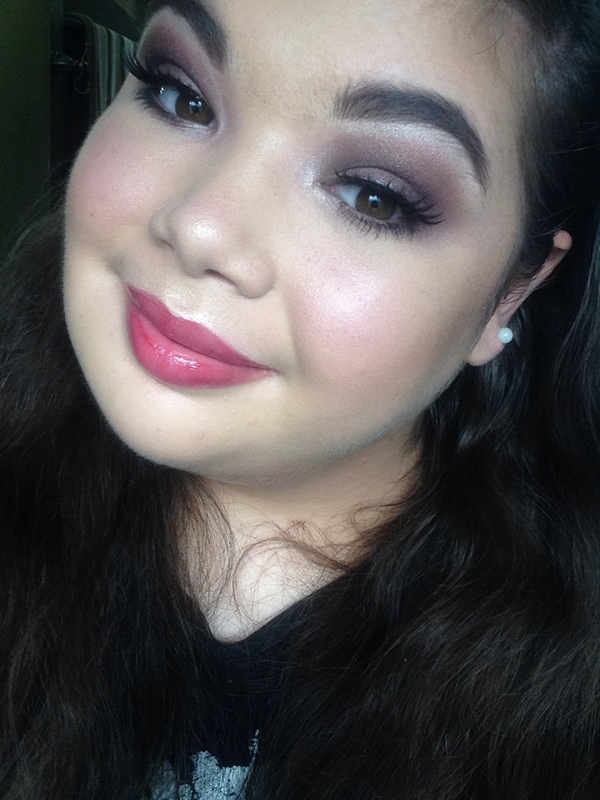 CHEEKS: I went into my Z pallet, and I took makeup Geek Soulmate Blush, which is a matte pinky plum colour. And I really buffed and blended that into my skin to make it look super natural!! I then took makeup forever ME-512 (a metallic gold shimmer!) and really buffed and blended that into my cheek bones, my nose bridge, and cupids bow. I think these shimmery MUFE shadows are my FAVOURITE for highlighting the face. They blend out like NOTHING, and look so so glowy and lit from within on me! EYESHADOW: I took ELF sheer eye primer, and I patted that into my eye lids from lashline to brow bone, and let that set for a few. I then took Sephora Brand Swan song (Matte light baby pink) and patted that all over my lids to set the primer! I knew I wanted to do a purple smokey eye based on one shade, so for once I used a transition shade, I took Lancome Strut (Matte light brown) and I lightly blended that up my lids, then I took a bit of Coastal Scents Barista (Warm matte brown) and I buffed that through my crease, but lower than I put the Lancome eye shadow!! I then took Lancome Statuesque (It's hard to describe, but it's a reddish purple matte base, with pink and red sparkles through out the shade!!) which is the eye shadow that inspired this look, and I patted that onto my mobile lids, and blended that upward into my crease. Now's when things get kinda bananas. But I took a Mauvey/light purple MUFE shade, and I patted that onto my inner half of my lid. Then patted MAC Embark onto the outer part of my mobile lid. Which looked super lovey. Until I took a buffing brush and blended everything out. 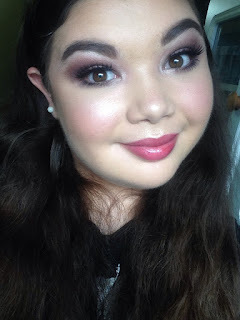 I basically ended up with this dark, purpley, smokey eye!! LASHES: I took a revlon mascara and super lightly coated my top lashes, then I took a fluffy full pair of lashes, and the Green tube of Duo lash glue, and I just popped the falsies on!! 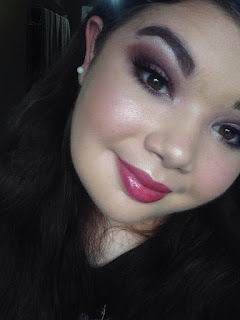 LIPS: I put on a thick layer of Jack Black Lip balm at the beginning, and then at the end when I was ready to do my lips, i just took Pixie Tinted Brilliance Balm in Bitten Berry, it's a super sheer light berry pink tinted balm!! 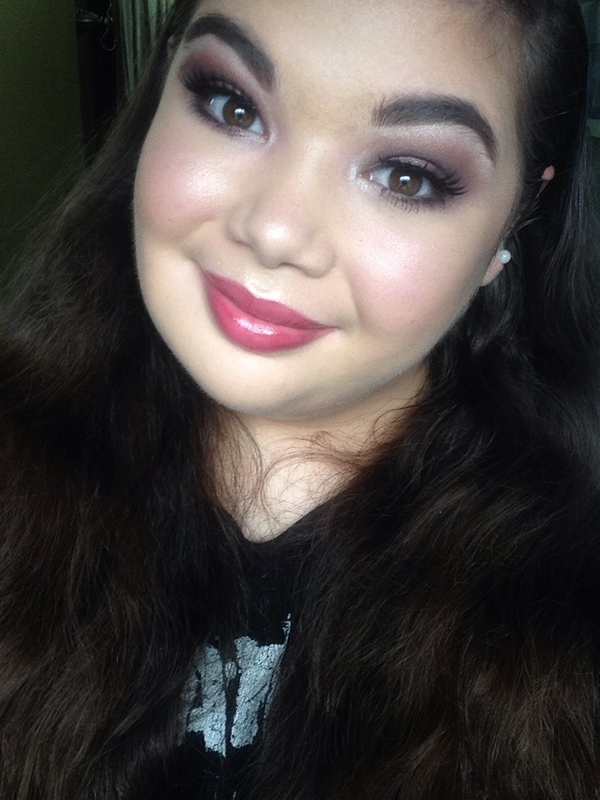 I wanted all of the focus to be on my eyes so I kept the cheeks and lips subtle!